They're an entry into the latest Iron Cupcake Earth competition. Go check out all the entries; you have until May 4th at noon central time to vote! Milwaukee Cupcake Queen, aka Sandy, who runs Iron Cupcake: Earth blogged that "In my humble opinion, the April challenge SODA POP, proved to be the most creative yet! Jones Soda, Izze, Stewarts, Coke, Red Bull, Mountain Dew, Barqs, Cheer Wine, NeHi, old and new hip or retro, so many bubbly sweet creations were born." I tried to remember my favourite pop growing up and all I could think about was cherry coke floats. We even had an old school fridge in the basement dedicated to holding all things Coca Cola. My dad used to get out the big beer steins and drop a great big scoop of ice-cream into them. My brother and I loved seeing the pop fly everywhere; my mother on the other hand... did not. 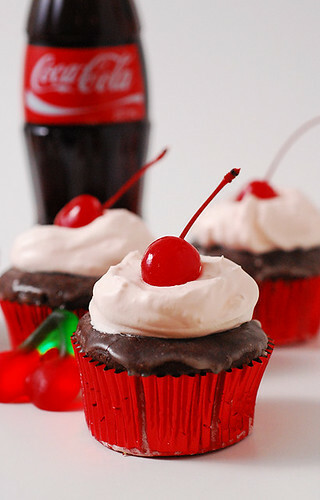 These cutie cupcakes are made with cherry cola, and even have a cherry baked into the center of them! The cupcake was glazed with a cola icing for the “float”, then topped with cherry buttercream, the “ice-cream”…and a cherry of course! 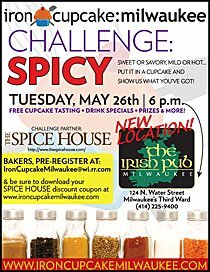 And for those who want to get their Iron Cupcake on, the May challenge is to make savory cupcakes! OMG those looks sooooo good!! i love it when there is the recipe, those are the cutest cupcakes ever! Thanks so much for posting this! We love "cupcakes take the cake!"